Though believed to be native to Asia, house flies now inhabit nearly every corner of the globe. With the exception of Antarctica and perhaps a few islands, house flies live everywhere people do. House flies are synanthropic organisms, meaning they benefit ecologically from their association with humans and our domesticated animals. As humans throughout history traveled to new lands by ship, plane, train, or horse-drawn wagon, house flies were their travel companions. Conversely, house flies are rarely found in the wilderness or in places where humans are absent. Should humankind cease to exist, house flies might share our fate. As an order, true flies are ancient creatures that appeared on Earth during the Permian period, over 250 million years ago. But house flies seem to be relatively young, compared to their Dipteran cousins. The earliest known Musca fossils are only 70 million years old. This evidence suggests the closest ancestors of house flies appeared during the Cretaceous period, just before the infamous meteorite fell from the sky and, some say, triggered the extinction of the dinosaurs. Were it not for environmental conditions and predation, we'd be overrun by house flies. Musca domestica has a short life cycle – just 6 days if conditions are right – and a female house fly lays an average of 120 eggs at a time. Scientists once calculated what would happen if a single pair of flies were able to reproduce without limits or mortality to their offspring. The result? Those two flies, in just 5 months' time, would produce 191,010,000,000,000,000,000 house flies, enough to cover the planet several meters deep. Hear that buzzing sound? That's the rapid movement of a house fly's wings, which can beat up to 1,000 times per minute. That's no typo. It may surprise you to learn, then, that they're generally slow fliers, maintaining a speed of about 4.5 miles per hour. House flies move when environmental conditions compel them to do so. In urban areas, where people live in close proximity and there is plenty of garbage and other filth to be found, house flies have small territories and may only fly 1,000 meters or so. But rural house flies will roam far and wide in search of manure, covering up to 7 miles over time. The longest flight distance recorded for a house fly is 20 miles. House flies feed and breed in the things we revile: garbage, animal dung, sewage, human excrement, and other nasty substances. Musca domestica is probably the best known and most common of the insects we collectively refer to as filth flies. In suburban or rural areas, house flies are also plentiful in fields where fish meal or manure is used as fertilizer, and in compost heaps where grass clippings and rotting vegetables accumulate. House flies have sponge-like mouthparts, which are good for soaking up liquefied substances but not for eating solid foods. So, the house fly either seeks out food that is already in puddle form, or it finds a way to turn the food source into something it can manage. This is where things get kind of gross. When a house fly locates something tasty but solid, it regurgitates onto the food (which may be your food, if it's buzzing around your barbecue). The fly vomit contains digestive enzymes that go to work on the desired snack, quickly predigesting and liquefying it so the fly can lap it up. How do flies decide something is appetizing? They step on it! Like butterflies, house flies have their taste buds on their toes, so to speak. Taste receptors, called chemosensilla, are located at the far ends of the fly's tibia and tarsa (in simpler terms, the lower leg and foot). The moment they land on something of interest – your garbage, a pile of horse manure, or perhaps your lunch – they start sampling its flavor by walking around. Because house flies thrive in places that are teeming with pathogens, they have a bad habit of carrying disease-causing agents with them from place to place. A house fly will land on a pile of dog poop, inspect it thoroughly with its feet, and then fly over to your picnic table and walk around on your hamburger bun for a bit. Their food and breeding sites are already overflowing with bacteria, and then they vomit and defecate on them to add to the mess. House flies are known to transmit at least 65 diseases and infections, including cholera, dysentery, giardiasis, typhoid, leprosy, conjunctivitis, salmonella, and many more. You probably knew that already, but do you know how they perform this gravity-defying feat? Slow motion video shows that a house fly will approach a ceiling by executing a half roll maneuver, and then will extend its legs to make contact with the substrate. 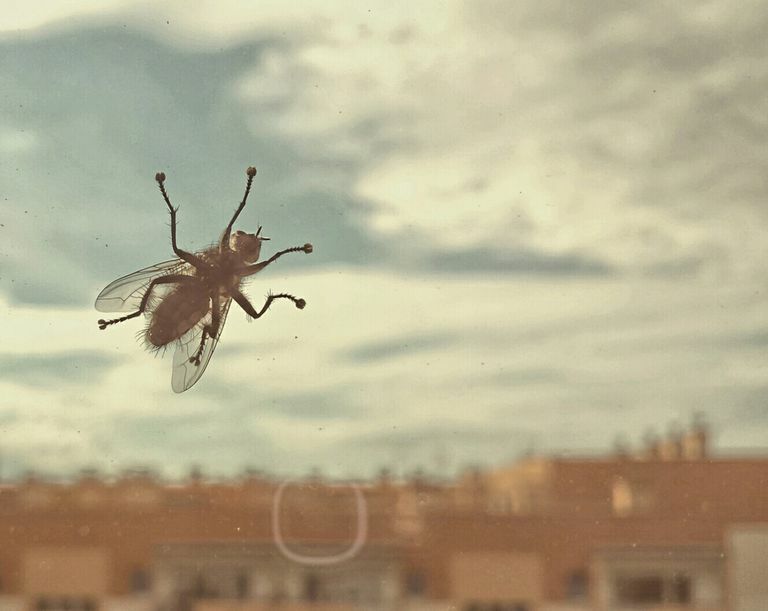 Each of the house fly's legs bears a tarsal claw with a sticky pad of sorts, so the fly is able to grip almost any surface, from smooth window glass to a ceiling. There's a saying, "Never poop where you eat." Sage advice, most would say. Because house flies live on a liquid diet (see #6), things move rather quickly through their digestive tracts. Nearly every time a house fly lands, it defecates. So in addition to vomiting on anything it thinks might make a tasty meal, the house fly almost always does poop where it eats. Keep that in mind next time one touches down on your potato salad. The Encyclopedia of Entomology, 2nd edition, edited by John L. Capinera. Vector Control: Methods for Use by Individuals and Communities, by Jan A. Rozendaal, World Health Organization. Elements of Entomology, by Dr. Rajendra Singh. "Time Flies, a New Molecular Time-Scale for Brachyceran Fly Evolution Without a Clock," in Systematic Biology, 2003. Do Flies Really Vomit and Poop on You--and Should We Worry About That?